TeleKast is your means for creative communication. It is an application you can use for your school, church or any organization which needs features like a script editor and teleprompter. Basically, you first create a script and then you can use it for just about anything. Broadcast journalism, whether in a school or professional television studio, can benefit from the built in teleprompter. The scripts could also be used for purposes such as interviews, feature stories or someone reading when standing in front of a crowd. Please let us know how we can make TeleKast work for you by submitting a feature request, or contributing to the users forum if you need technical support. And, finally, if you find a bug, please report it so we can fix it. Simple is the key to Prompt! as it scrolls text, either mirrored or not and has simple word processing functions (like cut, copy, paste and whatever you decide to type from within the program). Text can be imported and exported to and from the application in the standard .txt format as well as saved with a native Prompt! .pmt format. Try out the lite version before you buy. Prompt! saves its own file format so you can import text for the talent to read and then adjust the settings and then give the application and the file to your on-camera person to practice at their leisure in their own environment regardless of platform, either Macintosh or Windows. The scrolling settings you make stay with the file. Unicode/Multi-language support (flipped/unflipped or unflipped/unflipped). Universal binary that runs on both PowerPC and Intel-based Macs. Adjust prompter speed with mouse scroll wheel, up/down arrow keys, laptop trackpad or compatible remote controls! Pause and restart prompter at same scroll speed (via space bar or remote). UTF8 unicode support for non English languages and special characters. Save your settings at the end of a session and PromptDog will automatically restore those settings at the start of your next session. Optional second display for sessions with seperate operator and talent. Perfectly synchronized and resizable. One click text reversal for use with professional and DIY hardware alike. Displayed via an optional second talent monitor, the reversed text will appear normal when reflected off beamsplitter glass placed directly in front of the camera. CAN Prompter is a teleprompting application for MacOSX and Windows. It allows you “prompt” regular text files or script files created with CAN Script on up to three screens. It allows you to manage a list of separate files that will be displayed in order. You can speed up, pause or slow down the prompting rate. You can change the running order while prompting or loop the list for practice. CAN Prompter is really designed for computers with two or more monitors, though it will run on a single screen. Each output can be configured as b/w or w/b and/or mirrored output. In a television studio the second monitor is usually attached to an NTSC/PAL video output and sent to the cameras so the talent can read the copy, but you could also just take the standard VGA/DVI out of your graphics card and distribute that. Script-Q is the premier teleprompter program for the most demanding professional teleprompting uses. It has many studio teleprompter uses, such as radio, television, and multimedia production; business/government presentations; student audio-visual classes, video-blogging, and videoconferencing. Podcasters are already serving up Web-delivered audio and video content with custom narration supported by Script-Q, and even church choirs have found great success utilizing the Script-Q Prompter Software to help parishioners follow along with songs and hymns. Script-Q Prompter Software (also called teleprompter software or autocue software) has many studio prompter applications, such as radio and television production, business/government presentations, and videoconferencing. Church choirs have also found great success utilizing the Script-Q Prompter Software to help parishioners follow along with songs and hymns. Additionally, new age podcasters are serving up web-delivered audio and video content with custom narration supported by Script-Q Prompter Software. The newest version has been improved with a revised interface and more streamlined functioning; both the Basic and Advanced versions have been upgraded to offer new features as well, and a third version for professionals has been devised to include the most features of any Script-Q product to date. Script-Q is available in three versions in order to suit any application or budget. Script-Q Professional has an extensive feature set and is designed for the most demanding professional applications. It offers dual screen support, importing of Word™ documents, spell checker, or the support of multiple fonts in multiple sizes. If you are an everyday user of teleprompters, this is the version for you. Script-Q Advanced offers all the features of the Basic version plus support for dual screen use. This version is a favorite among our educational clients and small businesses. Script-Q Basic has all the standard features you would expect, a built-in word processor, the ability to import .txt and .rtf files, adjustable screen size, and much more. The Basic version is perfect for the occasional user, teleprompters that can flip the screen using hardware or for budget applications. Presentation Prompter helps you deliver successful presentations. It is built for anyone who has ever used cue cards or read from a script. Scroll content smoothly on one screen or two. Optionally flip the script only on the other screen if you’re using a mirror enclosure. Teleprompter operators see exactly what the talent sees on their own screen, resulting in better communication between the operator and talent. Accommodate any speaking rate or text size with precision speed controls using your keyboard, trackpad, or a dedicated remote. Adjust Presentation Prompter for your needs. Maintain your reading position with an adjustable focus arrow. Minimize talent eye movement with one-click margins. An on-screen clock and remaining time estimate help you stay within your allotted time. Don’t worry about accidental edits, screen saver activation, or other interferences while prompting. Write and modify scripts in a dedicated editing environment — there’s no need to use a separate app. Highlight speaker names, use a special style for difficult-to-pronounce words, and space lines perfectly to make them easier to read. You can use any combination of fonts, colors, and spacing for readability and emphasis. Make use of existing content and import anything in Microsoft Word, RTF, or other common file formats. Use bookmarks to navigate a large script or rehearse specific parts. You can mark a section of interest and jump to it instantly from the bookmarks menu. Find the right spot by naming the bookmarks and seeing live previews of the nearby text. Teleprompter is a fluid script editing and prompting application useful in not only in video or television, but also in presentations and speeches. The application keeps all the script editing and prompting in one, simple, easy to use, yet powerful document based solution. 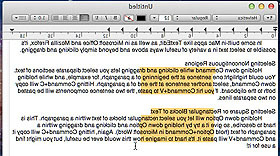 Teleprompter implements “Groups” which allows you to control up to four groups of scripts all from one computer, and allows the script to be edited while it is in motion, for last-second edits. Overlay and timeline features help you concentrate on your script and keep it at the right pace. It can be remotely controlled using an iPhone or iPod Touch and the “Teleprompter Controller” app available on the iPhone App Store, or from another Mac running Teleprompter. Teleprompter Controller is available here. iReview is an easy-to-use App that combines a auto scroll / flip teleprompter and a video recorder. iReview is ideal for making video reviews, YouTube videos, presentations, lectures, and even video messages. With iReview, shooting videos using iSight camera has never been easier and more efficient. Reading from the teleprompter, you can be just like a TV anchor, reading your script. You will appear much more confident, fluent and professional in your videos, eliminating all those annoying and embarrassing “uh”s and “um”s. Turn any Mac program into a mirror image. We have written a simple but powerful utility that will mirror any window on your Mac with a hotkey. This allows you to use your favorite software as a teleprompter, such as MS Word, PowerPoint, or any text editor or web browser. Instructions: First, run the utility, then switch to any program you want to create a mirror image of. Press the control-option-command-M hotkey and it will flip. Press the hotkey again to switch back to normal.